Digital transformation is the change related to the usage of digital technology in all aspects of business activities. In simple words, it is a strategy to redefine the use of information technology to improve the digital maturity of an organization. Undoubtedly, in the present time, every organization is looking forward to digital transformation. But most of the business leaders are stuck - where to start? This is something we can’t afford to ignore. Hence, we will focus on improving the customer experience part by empowering the workforce with the use of AI. 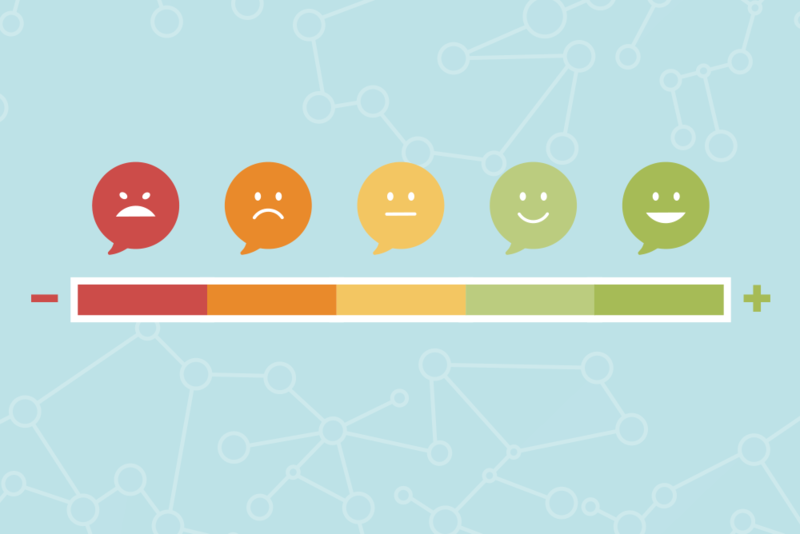 How is customer experience changing with time and technology? The senior generations tend to be more loyal, but the technology is influencing them too. For most of the industries, the meaning of a good customer experience (CX) has completely changed. For many verticals such as insurance, logistics, travel, telecom, utilities, retail, healthcare, automotive, manufacturing, automotive, BPOs, customer experience starts with their contact centers. Customer service offered to the customers in the contact center makes a huge impact. This is where customers’ expectations need to be fulfilled to boost brand loyalty. A great customer experience in the past was based on having customer service experts with good communication skills who can interact with customers and respond to their queries. In this process, the customer had to wait in the long waiting queues and were transferred from one department to another. There’s nothing hidden anymore, we all know and accept the fact that technology is influencing the nature of the relationship between consumer and brand to a great extent. Today, customers are smart and demanding and they want accurate and instant answers with a first contact resolution. Contact centers need to shift from being reactive to proactive and predictive, using “Digital Transformation”, businesses will be able to give a real competition to other businesses. Contact centers are no more a voice-only channel as before, technology has evolved and they have integrated multi-channel such as email, chat and other communications tools. When talking about digital transformation, you would want to be secured and the ability to add multiple channels and provide a smooth customer experience. OmniChannel means one desktop without any separate silos. AI will make OmniChannel simple when everything is in a single user interface. Once AI is trained by your best and experienced agents, it will automatically start assisting the agents with easy repetitive questions. AI will also assist in researching and finding relevant documents, find similar cases, fetch required info from billing or 3rd party systems. A customer named “Bob” observed, that he had canceled his reservations for his flight but he did not get the refund. Bob logged into his customer service portal and started a chat conversation. Despite being logged into his portal, he had to explain the problem and get his account verified. If the agent is unable to resolve the issue, he has to contact customer service through voice call and start the process over. At the end of the interaction, a good company will refund the amount, but Bob is still unhappy. Ironically, the company probably spent more money with multiple agents than the amount of the refund handling the request. With an OmniChannel solution (where there is visibility and integration across all channels), Bob would start the chat, the agent would see his customer status and could process a refund automatically. If Bob wants to talk about any other queries, all the research will be done by AI and specific account insights of up-sells and cross-sells would be visible to the agent, effectively making the agents smarter with AI. In the future, it’s likely AI will notice such errors and will automatically credit Bob’s account and proactively notify Bob about the refund being processed without any human intervention. Look for a system where agents are provided with research, suggested answers and agents are shown similar cases that were solved which reduces research time. Find something that automatically routes cases to the right expert, offers the right documents, articles, videos and forms which reduces their research efforts and ultimately saves the customer’s time. Digital Transformation is good for the customer, company and also the agents. With Artificial Intelligence (AI), natural language processing (NLP), machine learning (ML), the Internet of Things (IoT) and Big Data, Analytics will play a much more significant role in how contact center will move from reactive to proactive. The contact center leads the way to a digital organization. Companies will be able to proactively reach out to their customers with recommendations. Improving the customer experience by empowering the workforce with the use of AI will transform how the public purchases and consumes products. Mobile technologies and social media have introduced more options for customers to interact with businesses, creating new opportunities and challenges for customer service. The new enhanced modes of communication are taking over voice. But, voice is still king of the contact center. Finding the right “Bolt-on” OmniChannel solution, that can integrate with your current voice platform with or without an API. It is very difficult for the legacy voice providers to incorporate AI, ML, IoT and Big Data Analytics. When customers do not have the freedom to choose their preferred communication channel, it causes additional friction. 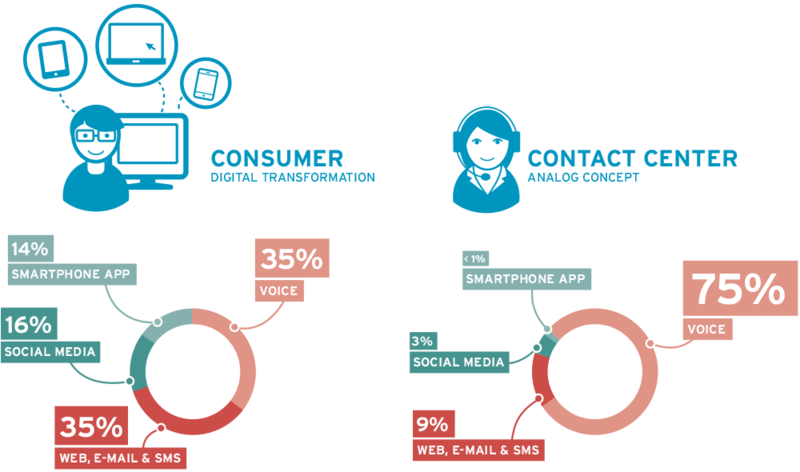 On the graphic below, the left-hand side is the contact center digital transformation of what customers want and the right-hand side is the analog concept of what channels are offered by companies who restrict customers to choose their preferred channel. The world is changing, and the way companies deal with their customers also needs to change. Customer expectation is changing with the innovation in technology in the way people communicate with friends and family, companies should also transform the way they communicate with their customers. The optimum and quickest way for businesses to get there is to “bolt on” to their current voice solution with an OmniChannel solution in the cloud. Now is the time, when most of the CIOs and CEOs should focus on their contact centers and consider it as the key tactic for business growth. By improving the customer experience by empowering the workforce with the use of AI will increase customer loyalty and grow customers. Gazing at the competitive dynamics in an increasingly digital world, it’s time for entrepreneurs to focus on the benefits of digital transformation in the contact center. Watch this video, on how AI works and assists your business in three areas: cost reduction, faster response and rise in efficiency. Digital Transformation is changing the way how customers interact with companies. Customer expectations are growing with digital transformation. 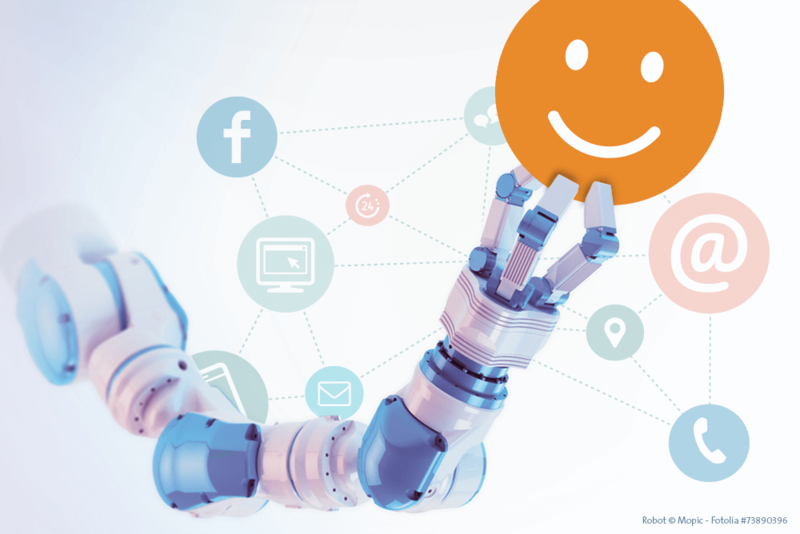 Artificial Intelligence, IoT, Machine Learning are the key for happy customers. Technology should be seen as a tool to help us, not hold us back, or replace us. I would love to have you contact us know your thoughts. Where else do you see AI bringing value to your organization?